Published: Aug. 5, 2012 at 09:21 a.m. 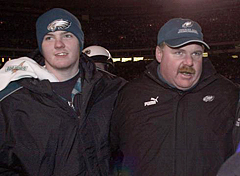 Updated: Aug. 6, 2012 at 06:53 p.m.
Philadelphia Eagles general manager Howie Roseman announced in a news conference that coach Andy Reid's absence from the start of Sunday's walkthrough practice was because his son, Garrett, had been found dead in his room at Lehigh University. "He's been strong for us, we're going to be strong for him right now," Roseman said before turning the news conference over to Lehigh University's chief of police, who said there was no evidence of foul play in Garrett Reid's death. An investigation by the coroner's office is underway. No cause of death had been determined. "What I can tell you is this morning we were contacted by the Lehigh campus police department and (were) requested to respond for the discovery of a deceased male," Northampton County coroner Zachary Lysek told The Associated Press. "We are conducting an investigation with the cooperation of the Lehigh campus police department, and I personally pronounced Mr. Reid deceased at the scene." The last time Andy Reid was believed to have missed a practice was when he was attending a 2007 court date for Garrett, who had been arrested on drug and weapons charges, according to Jeff McLane of the Philadelphia Inquirer. Garrett, 29, and his younger brother, Britt, each had drug problems in the past. He and Britt were arrested on drug charges after two separate traffic accidents in 2007. Garrett Reid was imprisoned off and on through 2009. Garrett Reid had rebounded from his troubled past and was assisting the Eagles' strength coaches at training camp. Many of the coaches stay in the Lehigh dorms. We extend our deepest condolences to the Reid family and all members of the Philadelphia Eagles organization. "This news is heartbreaking for everyone in the Eagles family," Eagles owner Jeffrey Lurie said. "Our hearts go out to Andy, his wife, Tammy, and their children." The Eagles also announced offensive coordinator Marty Mornhinweg and defensive coordinator Juan Castillo will oversee the team until Reid returns. UPDATE II: The Eagles will hold Sunday afternoon's practice as scheduled at 2:45 p.m., NFL.com and NFL Network's Steve Wyche reported. The Eagles' first preseason game is scheduled for Thursday, Aug. 9, at home against the Pittsburgh Steelers. UPDATE III: NFL Commissioner Roger Goodell released the following statement: "We are deeply saddened by the news about Garrett Reid. Our thoughts and prayers are with Andy, Tammy and their family. We will support them and the Eagles in any way we can through this difficult time." UPDATE IV: Services for family and friends will be held Tuesday, Aug. 7 in Broomall, Pa., according to the Philadelphia Inquirer. UPDATE V: Andy Reid released a statement through the team Monday. "On behalf of Tammy and our family, I would like to thank everybody for their tremendous support, love, kind words and prayers during this time of great sadness. Words cannot express our sense of loss. "We loved Garrett so much. He was a wonderful son and brother. He made us laugh, he was a pleasure to be around, he always had a smile on his face, and we will miss him dearly. We will never forget him, and we will remember him with love. "Garrett's road through life was not always an easy one. He faced tremendous personal challenges with bravery and spirit. As a family, we stood by him and were inspired as he worked to overcome those challenges. Even though he lost the battle that has been ongoing for the last eight years, we will always remember him as a fighter who had a huge, loving heart. "I spoke with the team yesterday and thanked them for their thoughts and prayers. I asked them to continue with their preparations for the upcoming season until I am ready to rejoin the team. "It is in times like these that we lean on our faith, our family, our friends, and our Eagles family. We will do so in the difficult times ahead. "Thank you again for your continued support."